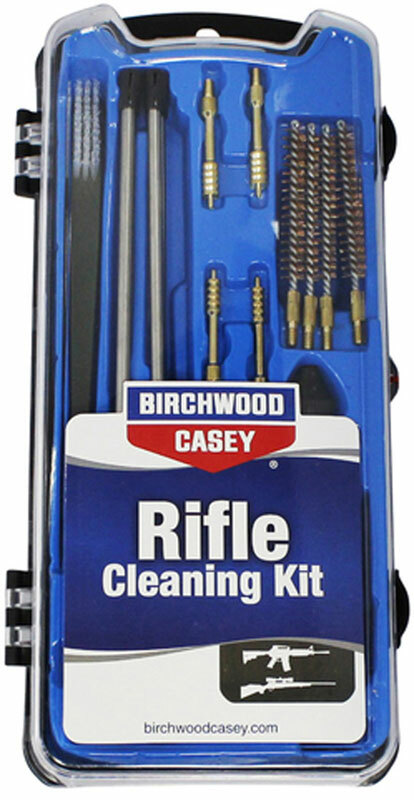 Birchwood Casey Handgun Cleaning Kit includes: 4 Brass jags (.22 cal., .223/5.56 cal., .243/.25cal., .270/.28 cal., .30cal. ), 4 Bore Brushes, 4 Stainless Steel Rod Sections, 1 Cleaning Handle, 1 Muzzle Guard, 1 AR-15 Chamber Brush, 1 Utility Brush, and 1 Patch Holder. This rifle cleaning kit has all the tools you need to keep your rifles at its highest level. It features cleaning accessories of today&apos;s most popular calibers. All come packed in an organized carrying case.